Here at Banned Apparel HQ we have had an increasing number of requests to produce more plus size clothing. Considering that the average size of today’s woman is 16-18 it did make sense to increase our sizing to suit. We have listened to clients’ feedback and we are gradually increasing our Banned Apparel plus size collection to include more and more of our original pieces. Today’s plus size is very different to the 1950’s sizing which started at a modern size 10/12! Plus sizes had more to do with shape rather than measurement which is why “stout” was a better description back then. 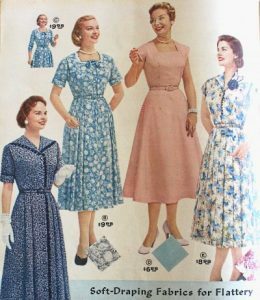 1950’s plus size dresses and skirts were typically tea-length and could be tank style, cap sleeve, short sleeve, or full length. Necklines were very modest, and dresses were often embellished with nice buttons or playful necklines with bows or scalloped edges. 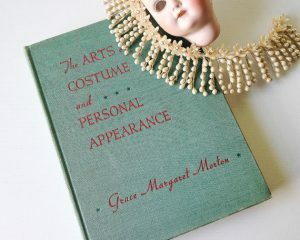 The following is an excerpt from a beauty advice book written in 1955. The advice is for plus size, short or tall, and how to choose clothing that flatters the wearer best. 1. Lines in continuous unbroken vertical movement, or upward- slanting diagonals. Very restrained curves will give added grace, whereas severe straight lines tend to emphasise rotundity. 2. Silhouettes which are graceful and flowing, of modified tubular versions, giving the impression of being draped on the figure. Easy, comfortable perfection of fit, because a fit too tight makes the figure appear larger. a. Sleeves cut on the bias will give a slimming effect when carefully fitted. When extended to the wrist in easy fit or terminating several inches above the wrist, they tend to camouflage the size of a large forearm. Wide, loose sleeves tend to widen the figure. Heavy upper arms should never be entirely exposed in evening dress, but partially concealed by draped sleeves or a graceful stole. b. Bustlines may be designed with slightly draped fullness or ease, rather than being revealingly smooth and tight, or again, they may be broken by some vertical or diagonal movement. c. Waistlines, usually thick in this figure, may be minimised by some irregularity of line which does not definitely define the waistline, as by seaming or panels which carry the eye upward and outward at the shoulder and inward as it approaches the waistline. Half belts or narrow inconspicuous belts of self material may be used. 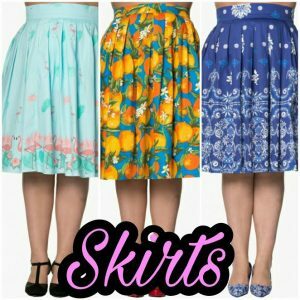 d. Skirts should be simple, easy, flowing in line, never tight and narrow, worn long enough to break the effect of heavy calves, always with some easy fullness at the bottom to give grace in walking and to balance the figure, cut straight at sides with centre pleats or gores having low placed flare at front and back. The coat-style dress draws attention away from the broad outline of the silhouette and breaks up the width in vertical areas. e. Coats may be full length, either straight or semi-fitted with easy loose-fitting sleeves. 3. Scale in accessories according to principle so that they apparently dwarf the figure, i.e., heavy jewellery, large flat bags, etc. All individual parts of the costume must be in scale with the size of the figure. 4. Spacing should be broken by long narrow verticals and upward slanting diagonals with emphasis always within the silhouette. c. Pockets may be placed high above the bust line to create the illusion of greater length below. 5. Values medium to dark in tone. Dull black has a receding effect. Close values in fabric combinations or in prints camouflage and obliterate lines. 6. Colours. Dark values which are soft and greyed in tone; cool hues and those that are cool-warm, depending on degree of stoutness, complexion, and temperament. One important rule is to buy only materials with body; those which have a good fall, which hang in fairly heavy limp folds. Do not use fabrics which are flimsy or fluttery, bulky or wiry, or stiff or shiny. Materials which have substantial draping qualities are never inexpensive but in the end they pay in longer wear and good appearance to the last thread. 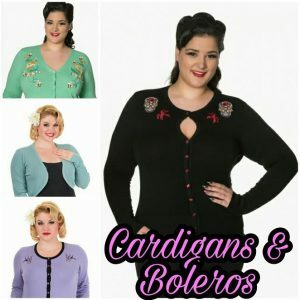 Make more of your cardigans plus size please! I desperately wanted your make belief cardigan but only available in small sizes. Thanks for providing the information regarding Plus Size Collection.